Billed as a prequel to the forthcoming Life is Strange 2, The Awesome Adventures of Captain Spirit is a short two-hour experience where players will take on the role of Chris, a 10-year old with an incredible imagination. While it is unclear on how this will connect to the much-anticipated follow-up to the original Life is Strange, we are told that Chris will factor into this sequel in a big way. This Life is Strange 2 teaser can be completed in well under 2 hours, even shorter if you bypass checking out all the comic books, action figures, and random notes and letters that fill this small two bedroom home. Skipping on those items, however; can result in learning considerably less about both Chris and his father, Charles, and can result in missing the few nods to the lives of Chloe, Rachel, and many more back in Arcadia Bay. Captain Spirit takes place in Beaver Creek, Oregon, some three years after Max and Chloe escaped Arcadia Bay, should you have picked the totally correct option during the finale of the original game and not the lame ending. I will stress that while it is never really talked about at length, there are clear signs of child abuse featured here that may turn off some gamers. This act is past tense as it has already occurred; with Chris sporting an injury at the hands of his father. What is also featured here, and quite prominently, is that Charles is a drunk with severe anger issues which seemed to have stemmed from the loss of his wife, and Chris's mother, Emily. There is more to this, but I'll refrain due to treading into spoiler territory. The core gameplay is based around exploring this small two-bedroom home and the small property around it. You have a task list that details destroying a snowman, fixing the water heater, knocking over a few beer cans, and more. While the former and the latter are simple events that don't require much imagination, the water heater is one such occurrence that is dressed up through the mind of this adolescent. When Chris approaches the utility room to fix the water heater, or rather, the Water Eater, as he calls it, the room is filled with a purple fog. Chris approaches the vile beast who looks at him with its red glowing eyes as if it was in fact, alive. It is moments like this can truly let the game shine, but we see this type of gameplay only a few times. For those that are huge fans of Calvin and Hobbes, It reminded me a great deal of the Spaceman Spiff moments from the comic strip, albeit a little more calmed down that how we normally see Calvin. The biggest choice that you will make, and one that I, of course, will talk about, due to how the story ends, is through the design of your costume. You can choose something more bulky and colorful, or light and far darker, or mix and match within those options. While it is unclear what choices will carry on to the actual Life is Strange sequel, it has been discussed that this game will impact elements of the story when it releases later this September. To build your costume, Chris will require a few items that you will find all over the house, several of which will require you to track down keys to the garage, secretly explore his father's room, or by simply donning the cape he has prominently hung in his closet, I mean, his Super Hero Wardrobe cabinet. Given the short playtime of the title, there isn't much here apart from being introduced to these characters and the situations that Chris finds himself in. His father is clearly a drunk who has issues regarding the loss of his wife, and it is very apparent as that he has taken those issues out on Chris. 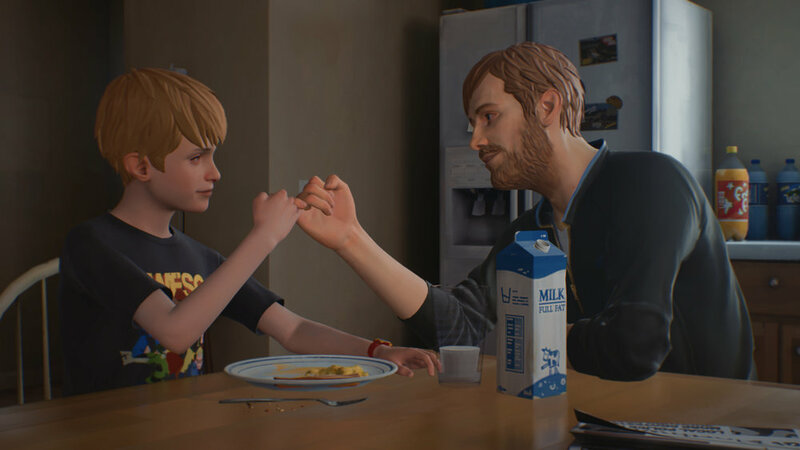 The breakfast scene at the start of the game can be quite awkward when Charles tries to bond with his son after he addresses the injury he caused to his own son's arm. As you play and search around the house, you can hear Charles swearing at the TV, watching his sports, an activity we are told that has caused Chris to miss on not only some important events he would have liked to have attended but also in the fact that he's been asking for some time now to get a real Christmas Tree. If you search hard enough and take part in exploring the entire playspace, you are given a great deal of information regarding his mother, and it becomes very clear how Captain Spirit's arch nemesis, Mantroid, received his name. To make up for the lack of extreme choices the series is known for, we get Superhero moments when you mash down the A button to crush a beer can, attempt to shatter a whiskey bottle or ignite a burning log in a fireplace. These may seem bland and uninteresting events, but to a 10-year old who believes he has magical powers, these moments are everything to him. The final moments of the episode are also quite interesting as what occurs must certainly in some way resurface in the upcoming sequel; I mean, it has to. Whether or not we play as Chris or have him feature as a sidekick or reoccurring character is yet to be revealed, but I'll be shocked if the story isn't in someway spun around the ending featured here. After just recently playing through LIfe is Strange: Before the Storm, despite that prequel being handled by a different developer, it is clear that the future of Life is Strange is going to see a fairly substantial visual upgrade. The visuals here are a clear sign of that as nearly every aspect of the environment, and even the character models, look far better than what we've seen in the franchise so far. It's not a drastic last-gen to next-gen difference, but it is certainly noticeable. When The Amazing Adventures of Captain Spirit was first shown off at E3 2018, I was disappointed that the LIfe is Strange announcement wasn't centered around Chloe and Max, and I'm sure that Life is Strange 2 proper will also feature a completely new cast, but regardless, I just wasn't feeling what I had seen. Given that Captain Spirit was entirely free, I decided to give it a chance. 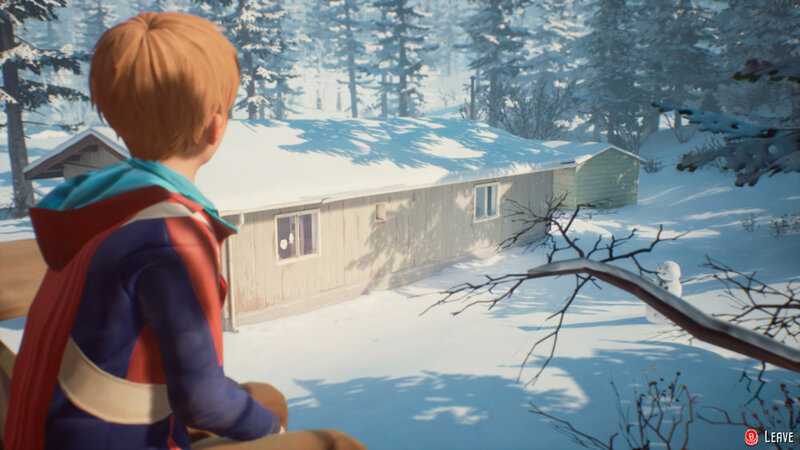 While it certainly can be entertaining and almost come off as a real-life version of Calvin and Hobbes, if Calvin was raised in a broken home with no Hobbes, it does contain that same Life is Strange charm. I was already hyped for Life is Strange 2 and Captain Spirit has certainly made me even more excited for what is in store from the developer. The Awesome Adventures of Captain Spirit was purchased by the reviewer.